Love all things Lincoln? Interested in local history or the history of African Americans in East Central Illinois? If the answer is yes, please follow us on Facebook to stay up to date . With a new venue, it seemed an ideal time for our long-time actors to focus on behind the scenes planning and to recruit new performers. Marylee and Kim McGee and Roger Ashmore have done an outstanding job of researching and portraying Mary Corbin, Dr. Hiram Rutherford, and Gideon “Matt” Ashmore since the beginning. Because of their work it will be easy for new people to step into the roles. Director, Bill Thomas, says “We are particularly interested in two men between the ages of 30 and 60.” Anyone interested in bringing these characters to life should email Thomas at williebcreative@gmail.com. A new addition to the cast is Ed Adams, who recently moved to Charleston, will portray Anthony Bryant. Ed performed as Frederick Douglass in the early years of Trial & Tribulations. Ed believes he is distantly related to Sim Wilmot, the brother of Jane Bryant. Callie Baber, of Callie Baber Auctions in Paris, will be playing Mary Corbin. Callie has acted in several productions in the area including "A Question of Loyalty" about the Charleston Riot. Callie traces her ancestry back to the Hanks Family, as does Abraham Lincoln's mother. The new venue is the Oakland Methodist Church and the Methodist Women’s Club will be the caterer. “We are very excited about this new partnership,” explains Renee Henry, program coordinator. The quaint white frame church retains a historical atmosphere similar to the Columbian Building. Henry notes the ties to the Methodist church are significant, too, because Anthony Bryant, the patriarch of the Bryant family, was a Methodist exhorter (a type of lay minister). While the Methodist congregation did not formalize until 1856 in Oakland, Dr. Hiram Rutherford reported that his first wife attended Methodist camp meetings and, in fact, died following one such event. The kitchen adjacent to the eating area will make it easier to serve the 1847 dinner and to clean up. In addition, the Methodist Women have an outstanding reputation for delicious meals. Seven years ago an event arose to celebrate local history and to draw tourists to learn Oakland’s historical link to Lincoln. 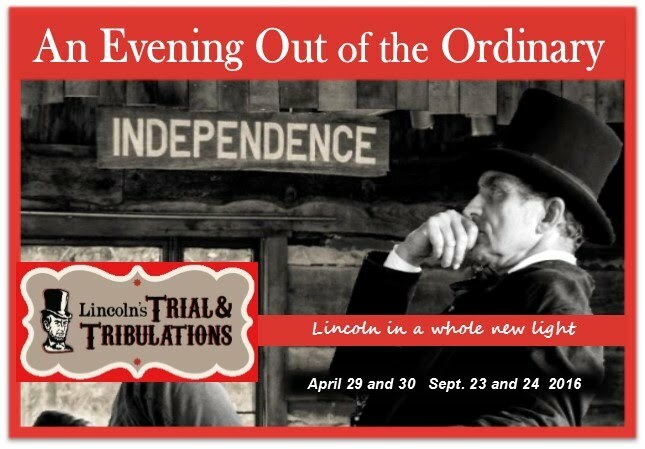 Lincoln’s Trial and Tribulations, the dinner/theater program founded by Landmarks, Inc. and Independence Pioneer Village, accomplished just that receiving compliments from Lincoln scholars, gaining recognition as one of four Signature Events for the Abraham Lincoln National Heritage Area and Looking For Lincoln, and drawing people from throughout the Midwest. With success and time also comes changes, and this year the program includes a new venue, caterer, actors, schedule and expanded associated programming.